Came to Bolton with his family in 1862 and immediately started work at Wainwright & Hardcastle's Mill in Brook Street. At 15 he became an overlooker and at 17 he became a manager at the company's Daubhill Mill. He later became Manager at Holdsworth's Marsh Fold Mill. Next he went on the clerical staff of Grecian Mill, then Secretary for Crosses & Winkworth's for several years. He finally became Manager of Thomas Taylor & Sons Grecian Mills before buying Rumworth Cotton Works, which he sold in 1919. He founded Pioneer Life Insurance in 1891. Represented Rumworth Ward 1896-1904. Alderman from 1904. He was Chairman of the Licensing Committee 1903-5, the Finance Committee 1905-15 and the Watch Committee 1915-28. Member of Lancashire Asylum Board, representative for West Lancashire Territorial Association. Chairman of W H & J Wood Ltd, Tobacco Manufacturers of Glasgow & Preston. Fellow of the Institute of Directors. Anglican - he was a teacher at St Paul's Church Sunday School and attended Christ Church, Heaton in his later years. His wife, Elizabeth, was Mayoress. 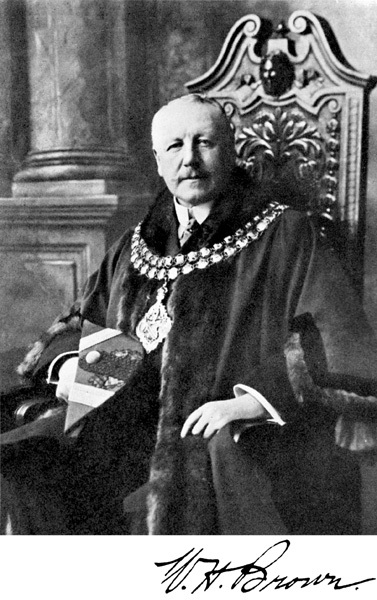 Formal portrait of William Henry Brown as Mayor of Bolton. 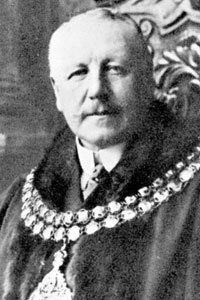 William Henry Brown's link on the Mayor of Bolton's Chain of Office. 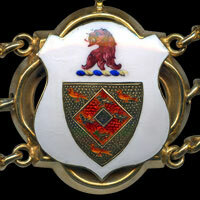 Or on a mascle between three martlets gules four lions passant of the first. Crest = On a wreath azure and argent a lion's head erased gules.